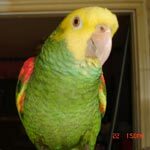 Parrot Forum • View topic - New and EXXXXCITED! I'm just overwhelmed, "Little Bird". I am half Mexican, so that's my heritage. I will devour anything you teach me about my Patagonian. I'm realizing now that it's been a while since I took a fresh look at him, his diet, his general welfare, all of that. It's my pleasure, Gail. And, yes, it pays to be always on the lookout for improvements on our husbandry because, thankfully, we are learning new things about them all the time. Yes you are a Love Bird. I hope you stay with us and become a Macaw. Y'all are so smart and welcoming and encouraging... I'm sure I will! When I visited Chile in 1999 I remember seeing that the Tricahue was featured on a postage stamp. It was on display in the entry way, but when I tried to buy them, there were none available, and no one could tell me if they were available anywhere else. A Patagonian conure lived with me at the time, so I was very interested in buying a few of them. What an amazing adventure that must have been. I love watching YouTube videos of them in their native lands. Lots of experience and passion here. Good to "see" you two.